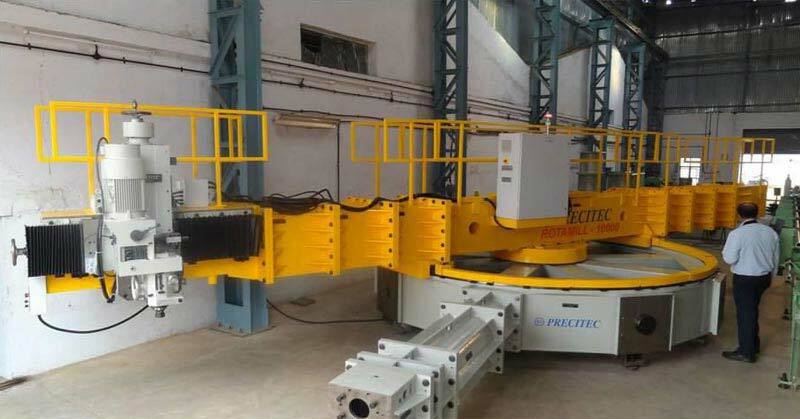 The Horizontal Rotomill is an insitu machine developed for machining heavy components used in Power Plants, Ship building, Cement industry, Wind mills, Sugar Industry, huge chemical plants, refineries, etc. without having to move the job. The Horizontal Rotomill consists of a circular frame with spider arms which permit it to clamp on the surface of the job. At the center of the frame a rotating arm is located and this arm houses a rotary drive from an electric motor which can be infinitely variable depending upon requirement. At the end of rotary arm, the machining unit is suitably located. Depending upon the requirement of the machining operations of Horizontal Rotomill to be carried out suitable spindle unit with required axis movement slides/devices is selected. The special feature of the Horizontal Rotomill is, it doesn't require foundation and the machine is portable type so that the machine can be moved to the job. Special packing methods and containers are used to store the Horizontal Rotomill and for transportation when not in use. Operations Possible : Flange Face milling, Grove machining, ID and OD machining of flanges. Hole Operations : Drilling, Boring, Counter Boring, Tapping etc.